"You ask how the watch is made. Keep your eye on the time." A quiet street sits idle and in the distance a woman is seen walking a dog. It's a moment of serenity and stillness, which is notable because it's one of the very few that the next two hours will have. Suddenly that serenity is gone, as fully armed FBI swat team members move in from the left of frame and our perspective of what seemed like an innocent street has changed as we now suspect something malevolent is at play. And thus begins a prevalent and reoccurring theme of 'Sicario', that of malevolence lurking under innocence, and things not being always as they seem. We are then introduced to Kate Macer, played by Emily Blunt, an FBI agent with good intentions but a lack of understanding of how the system works. She is brought into a team that is out to rid of drug cartel on the U.S & Mexican borders by eliminating an anonymous drug lord. What makes Kate a compelling character is that she isn't a badass who is going to single handedly take out all the villains. No, she's vulnerable and anxious yet brave and determined, she will pull the trigger and take out an enemy when need be but prefers a less a fatal form of justice. The film is telling a gritty and realistic so it's great to have a central character that feels genuine and human and not a action-heroine who can fix the drug problem with a solitary bullet. From the get-go, 'Sicario' grabs a hold of you and refuses to let go. It's so relentless that even the down points and dialogue heavy scenes have an uneasy aura that keeps you on your guard. The film is flawlessly shot, which should come as no surprise seeing as it's filmed by the best DOP alive, and probably the best ever, Roger Deakins. I'm one of those people who could just swoon over the man's abilities and body of work, and complain about his lack of Academy Awards, for hours on end, and 'Sicario' is yet another example of why the man is so well respected. Absolutely stunning photography that complements the tension is building in absolutely perfect fashion. Those mesmerising copter shots give the desert a life of it's own. Jóhann Jóhannsson's score is fantastic too, every time it kicked in, the tension rose and you were kept on your toes. I'm very fond of Emily Blunt, I think she's an excellent actor with very broad range. Her performance in this film may be my favorites of hers thus far. As I alluded too above, her performance is multi layered, which allows her to portray vulnerability, fear and bravery. She's fantastic. I always love to see Josh Brolin and he's in his absolute element in this film, providing some much needed comedic relief at times and always being witty and entertaining. As good as the cast is all across the board, the film really belongs to one man, and that is Benicio Del Toro. I've been a huge fan of Del Toro's for many years now, I think he's a phenomenally talented performer, but I've noticed that he's taking roles in more commercial or ensemble films in recent years, while he's always good, he never really gets the chance to shine like he did earlier in his career, that isn't the case with 'Sicario'. From the moment Del Toro's character, Alejandro, enters the frame, he completely commands the screen and makes the film his own. Alejandro is a hazy character, in that for most of the film, we are certain where his allegiances truly lie or what his motives are, and that just makes him even more commanding when he's on screen. He has moments where he is a helpful and compassionate and other times he is absolutely ruthless and terrifying. There is no way he doesn't get an Oscar nom for best supporting actor. Once again Denis Villeneuve has delivered an impeccably crafted, tenaciously paced, gritty thriller that continues his sublime form. He is quickly becoming one of my favorite filmmakers and 'Sicaro' rivals 'Enemy' as my favorite of his filmography. I absolutely loved this film, it was a truly unique and exhilarating cinematic experience that had me on the edge of my seat for practically the entire duration. 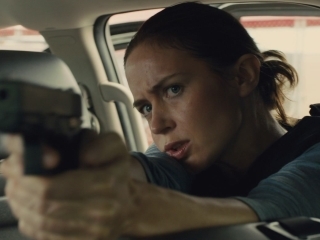 'Sicario' will surely go down as one of my favorite films of 2015.